WPT Poker will close on the 3rd of June 2015. This announcement made by bwin.party indicates that they are going to focus on Party Poker, and you should be looking to migrate to that option. If you are looking to start playing at Party Poker with the minimum of fuss and effort, you will be able to download Party Poker for Mac here. In the online community, a big name is often the most important thing for many people. There is still a large amount of wariness about online transactions and people will naturally seek comfort in brands they recognise and trust. This is especially true in the online poker community where there are so many potential pitfalls to be aware of. It would be correct to say that over the years that the WPT Poker site has not been the best for all poker players but the fact that the WPT name is synonymous with poker has helped many people turn to the site. This has enabled the site to grow and develop and it definitely provides a better option for player compared to what it used to provide. However, with the level of competition in the online poker community being what it is, the WPT Poker site still has to work hard to get to the level of many of the best poker sites. 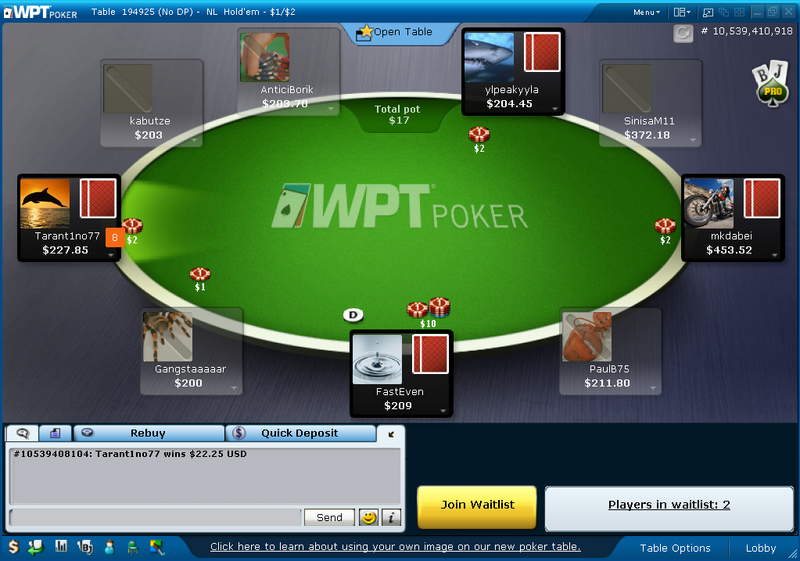 Mac users are able to experience the WPT Poker site through the instant play browser option available on site. As you would expect, the site makes the bigger play about the download software option but this is not suitable for Mac users. Thankfully, the browser option is perfectly acceptable and gives a good option for players looking to make the most of their poker time. 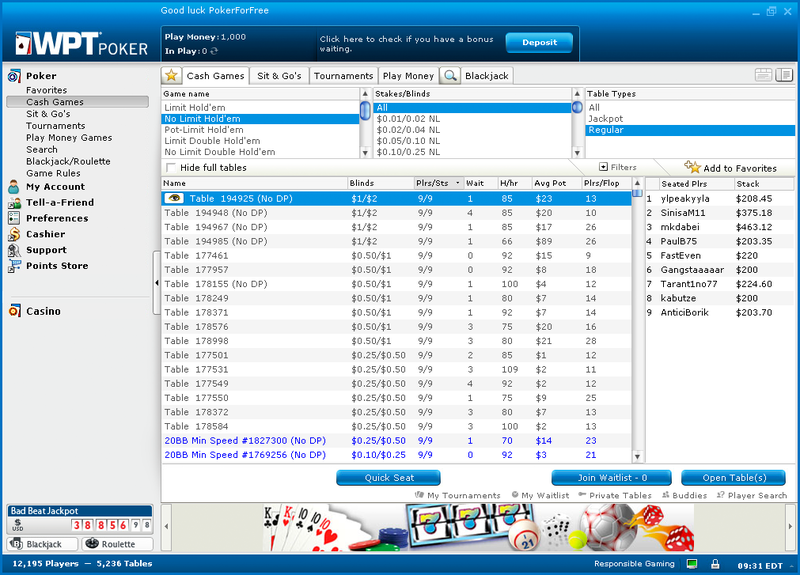 With respect to the usability of the software, it would be wrong to say that the WPT Poker software was at the cutting edge of facilities or techniques. However, it is a site that can be used without any trouble for the majority if online poker players and novices should find the system to be user-friendly enough for their needs. There is a good filter option available which can help to speed up the process and a quick seat option is always a good option for an online poker site. The WPT Poker for Mac users may not experience all of the benefits of the software due to playing in browser mode but they should still find it an easy enough software to use. The deposit and withdrawal methods are always going to be crucial when thinking about if a poker site is right for you and the WPT Poker site provides a number of options. If you are looking to make a deposit into your account, you will find that the major debit and credit card options are available such as MasterCard, Maestro, Visa, Visa Electron, Switch and Solo. E-wallet payment methods have become very popular in recent times and it is worth noting that WPT Poker provides a PayPal payment option. This is in addition to Paysafecard, Entropay, Click2Pay and Skrill. It is also possible to deposit funds via bank transfer or wire transfer. With respect to withdrawing your winnings, WPT Poker allows players to utilise the major credit and debit cards and e-wallet options like PayPal, Skrill and Neteller. It is also possible to receive a cheque for your winnings, which will obviously take a longer period of time to get to you. Once you know that a site is suitable to play on a Mac, your next thought should be to check out the bonuses on offer. Even if a site has made their games and tournaments available for Mac users, they should still be going all out to entice players on board. This is where the right choice of bonus can make all the difference and the WPT site has a reasonable bonus for new players that sign up for the site. There is a 100% matched bonus on offer, up to $100, for players that use the correct bonus code. Like many poker sites, WPT provides the bonus in 10 instalments and the bonus is valid for 60 days. This may impact on how much money you want to deposit initially to get the best value for your cash but it certainly isn’t an inferior bonus offer in comparison to many of the popular poker sites. Again, this bonus is perfectly suitable for WPT for Mac players. Depending on which currency you are using, you will find that there are different bonus release conditions, so make sure you are aware of these. This is the same for WPT for Mac players as it is for standard players. If you are playing in euros, you have to earn eight times the bonus amount in WPT points. If you are playing in US dollars, you need to earn six times the bonus amount in WPT points. If you are playing in GBP, you have to earn a massive 9 times the bonus amount in WPT points. Scheduled tournaments and sit n go tournaments both feature on the WPT Poker site and to be fair, they feature extensively. The site has a very strong roster of upcoming tournaments on their schedule, which is well worth checking out. Whether you are a casual player who only has a set amount of time to spare a day, week or month on poker or you want to play as often as you can, let the WPT schedule be your guide. No matter what interests you, there should be something of interest on the WPT schedule and yes, all of these events are suitable for Mac players. This is more than enough to offer players plenty of chances to enjoy their favourite poker games but the tournaments offer a far greater level of variety than this. You should be able to play regular, shootout, rebuy, speed, heads up and even bounty games in the tournament so if you have a particular preference, get on board. There are various buy-in levels so even if you have a budget you will be able to join in the fun and as you would expect, there are no limit, pot limit and fixed limit games to choose from. With respect to what you are playing for, again, there is a great deal of variety on offer from the WPT Poker site. There are daily freerolls where players can earn a share of $5,000 or grab exclusive WPT gifts. There is a $,5000 weekly game billed as the Bankroll Booster and let’s face it, every poker player could do with getting their hands on more money for their bankroll. If money is important but not all important to you, you may want to have a look at the satellite events provided by WPT Poker. The site can help you live your dreams in seeing the world’s best poker player in the best poker locations. These tournaments and prizes change depending on what is forthcoming but at the time of looking at the site, players were able to play their way into the WPT Milan or WPT Paris events. The prize total for these satellite events amounted to $6,500 and $13,000 so there is a huge incentive for players to dream big and go for the big time. The big game of the week is the Guaranteed $200,000 Sunday game and if you like to plan ahead, you can win one of 50 seats that are provided to midweek winners for this game. Playing for your share of $200,000 is a big incentive for most players but getting the chance to do it for virtually free has to be seen as a great way to spend your online poker time. With plenty of freerolls on offer, there is no need to spend big to be a big winner with the WPT site and this is as true for Mac users as it is for PC users. If you have an interest in the rake on the WPT Poker site, it is a simple enough process. For anything below the $0.5/$1 limit, the maximum rake is $1 with $0.05 taken for every dollar. As you progress to $2/$4 to $30/$60, the maximum rake you can receive is $3. When the limits go above $50/$100, the maximum rake rises to $5. There are plenty of good reasons to consider the WPT Poker site and the fact that Mac users can join in the fun is a very important feature. If you are looking for a reliable poker site, this is definitely one of the best you’ll come across.